Use our beautiful Calendar to view and plan your appointments and business with a smile. View all your bookings neatly organized by date in Calendar. The top row displays the staff members on duty. You can view all assigned bookings in a glance, and managing them could never be any easier. You can give login access to your staff members and they will be able to login to Resermy Admin and more importantly, their own calendar! In addition, you use different colors for different services like above. 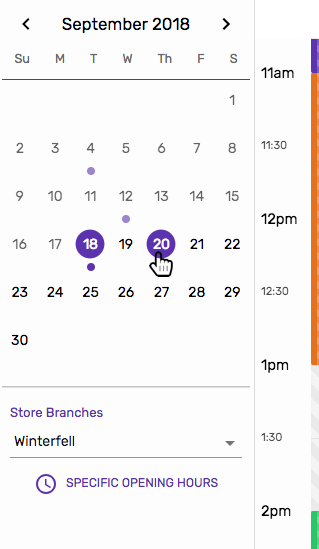 Of course you can view booked appointments of different days, simply click on the date of the calendar view at the left. Use the left and right button to traverse to a different month. Then click on “Add New Booking” when prompted. Similar to staff members’ working hours, sometimes you might want to set different business hours for your store. For example, closed on public holidays, or different hours on specific days, etc. Everything can be done easily from the Calendar page. At the left panel, just click on “Specific opening hours” to set up different opening hours. 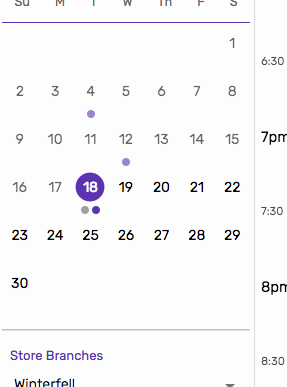 If you’ve set specific opening hours, you’ll notice a grey dot underneath the date on the calendar. The available time slots for customers to book are relied on the availability of your staff members. So, if your staff members aren’t available at a particular time, say they are going out for lunch, leaving work earlier, you can always easily block off their availability. On the staff column, click on the slot and click “Edit availability“. 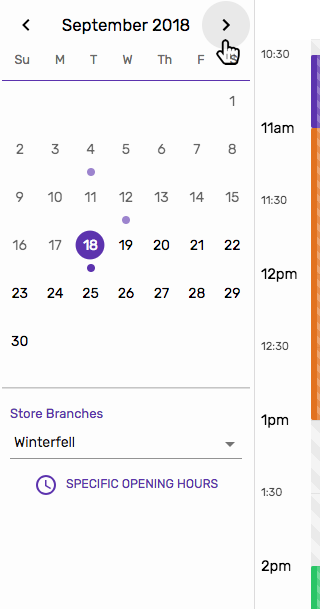 If you have multiple store branches, switch your calendar by toggling the dropdown.